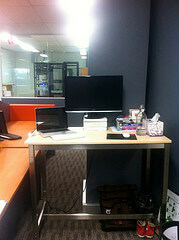 Home/Uncategorized/Building a Standing Desk at Work? Lifehacker has a very detailed article online right now on how the average cubicle worker can turn their workstation into a standing desk. There are actually half a dozen ways to do this for less than $50. So, it might not be as hard as you think to find the budget for this kind of project. You can also try a no-cost approach. Just set your monitor, keyboard, and mouse pad each on different sized boxes or risers on your desk to create a landscape that puts everything at the right height for standing work. That’s actually a good way to experiment with this position to see if it is something you want to do all day or if an adjustable sit-to-stand model would work better. The author of the article does point out one potential issue with creating a standing desk in the middle of a sitting environment. Other employees may not appreciate someone looming over them. If you’ve ever been annoyed by a coworker popping their head up over your cubicle wall to chat, you can relate. It just seems too intrusive – and today’s cubicles with their lower walls just make the issue worse. However, this doesn’t mean that the proverbial “nail that sticks its head up” must be hammered back down. Desk mounted privacy panels can be added to just about any standing desk. Or, panel extenders can be installed on surrounding cubicles to give coworkers back their privacy. Like the box method for experimenting with a standing desk, these panels can be added, removed or reconfigured in minutes. There’s really no downside to giving them a try. Managers take note: Just having the option to decide whether to sit or stand and how high their own cubicle walls should be can give employees a greater sense of satisfaction at work.